The weather has been beautiful lately here in sunny Orange County, making it a perfect time to get out and do more with your dog. Soak up the sun and take your dog to the beach! Many beaches around here allow dogs year-round, though certain beaches restrict dog access during specific hours throughout the summer months. Huntington Dog Beach is the only beach that allows off-leash dogs, but we recommend keeping your dog on a leash for safety purposes, especially if his or her recalls aren't the strongest. Leashed dogs are welcome on many beaches in Laguna, including Main Beach and Crescent Bay. Most restaurants will let you bring your dog onto their patio, and some restaurants even have a menu specifically tailored to canines! Taking your dog out to eat is a great way to strengthen his or her patience, focus, and obedience skills. Bring a mat along and practice the Go to Your Mat behavior! Most outdoor shopping malls, including the Irvine Spectrum in Irvine and Fashion Island in Newport Beach, allow dogs. While they are permitted throughout both centers and on most restaurant patios, it's up to the individual stores to allow dogs inside. As long as your dog is polite and friendly, most stores will welcome him or her! 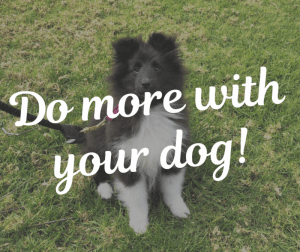 Signing up for a fun class is a great way to bond with your dog. We offer various classes like musical freestyle, agility, sport dog, rally obedience, nose work, and tricks. We have SO many different options for all kinds of different interests and lifestyles. Click on the links below for more information about our classes! Musical Freestyle - Canine Freestyle is a modern dog sport that is a mixture of obedience training, tricks, and dance that allows for creative interaction between dogs and their owners. Musical Freestyle classes are 5 weeks long and $125. Agility Training - Agility is the exciting dog sport where dogs learn to cross over, crawl through, and climb over obstacles such as tunnels, jumps, and weave poles. Agility classes are 6 weeks long and $150. Sport Dog - Bring out your dog's inner athlete! Our Sport Dog classes will improve your dog's endurance, strength, and flexibility. Sport Dog classes are 6 weeks long and $150. Rally Obedience - Rally Obedience is a sport where you and your dog navigate a course together as a team, side by side. The course consists of 10-20 different signs. Each of these signs provides directions for the next skill to be performed. Rally Obedience classes are 5 weeks long and $125. Nose Work - Inspired by working detection dogs, Nose Work is the fun search and scenting activity for virtually all dogs and people. This easy-to-learn sport builds confidence and focus in many dogs. Nose Work classes are 5 weeks long and $175. Tricks - Trick dog training improves obedience and strengthens the bond between you and your dog. Learn some fun behaviors like “shake,” “play dead, ”rollover,” and more in this lighthearted class! Tricks classes are 5 weeks long and $125. Ready to sign up? Take a look at our class schedule and register today!